Last week's Blogwalk 4 yielded a new tool (for me anyway) of the Wiki Window. I was a bit late arriving, and bloggers had been discussing issues that can arise in getting blogs and wiki introduced in companies. 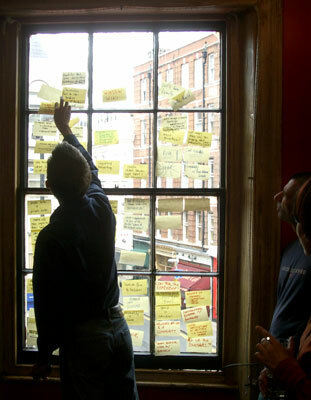 The upper room of the Old Crown pub in London's New Oxford Street didn't offer easy wall space for the Post-it notes, so reasonably enough they were posted on the window, topped with the title Window Wiki. It was a bit more, well, transparent than a flip chart. Some of the items were about blogging as such (every bloggers need an audience), but many others were more general... improved networking...risk...vulnerability...need for commitment to share...culture change. It struck me that blog and wiki discussion had indeed provided a window into a set of issues around change - something I also picked up in discussion about the technology trap. The whole day was a wonderful opportunity to explore these issues with people from different backgrounds and jobs. A bit of tech crept in - and very useful it was - but my sense was that the value of blogging (and bloggers) lay in the way it enabled individuals to make more of a difference than might be expected in large organisations, and small, and explore in the process all the issues that change and innovation brings. We walked as well, of course, and there are a few more pictures here of our more physical exploration of Bloomsbury. There's another metaphor in there somewhere, too.